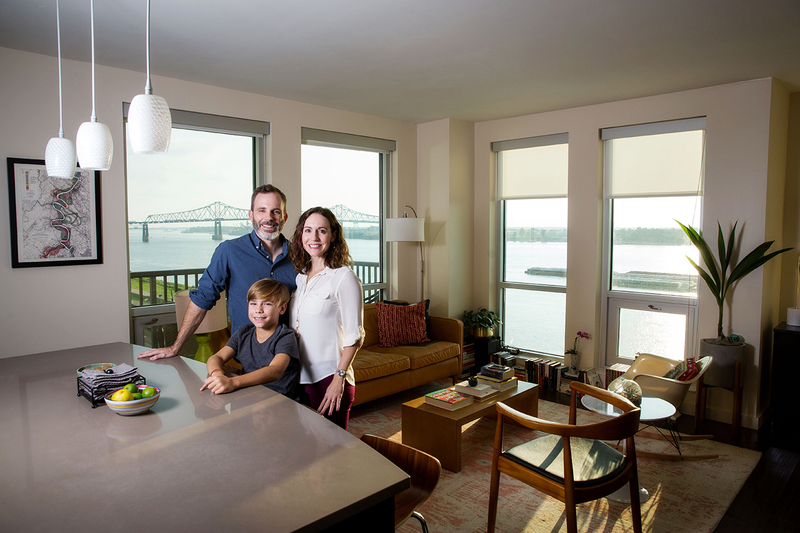 Andrew Fitzgerald, Katie Pryor and John Kirby are the poster faces of downtown living in Baton Rouge. That’s nothing official, mind you, but they no doubt fit the profile: Young professionals with promising careers living at the swanky Commerce Building apartments, located within walking distance of their offices in the heart of the arts and entertainment district. 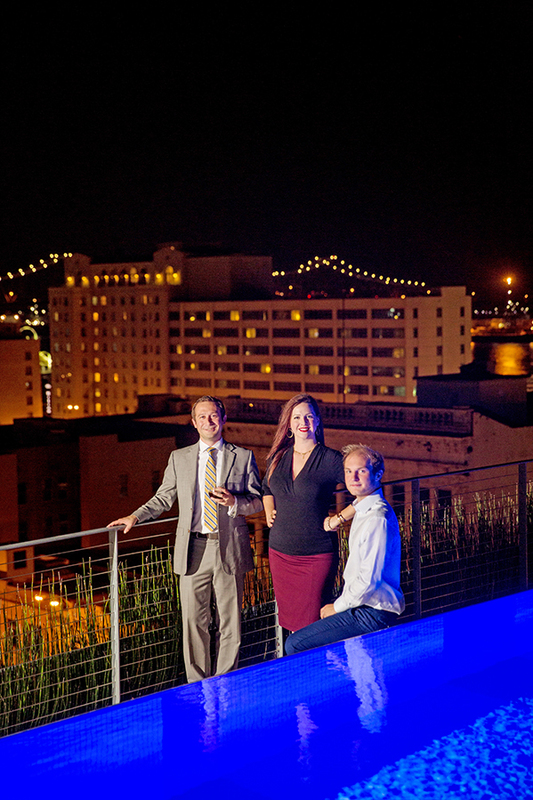 Outside of work, they hang out at the pool on the rooftop of the Commerce Building overlooking the Mississippi River. On Sunday nights, they walk over to the Draft House across Third Street to watch “Game of Thrones.” They frequent downtown events, they dine together and they have a message group on the GroupMe app to chat with their other downtown-dwelling friends. It’s the quintessential live-work-play lifestyle downtown Baton Rouge has been trying to create for more than 20 years. Fitzgerald, who moved here from Chicago in 2015, is the director of business intelligence at the Baton Rouge Area Chamber. Pryor, an Alabama native, is the director of the Baton Rouge Film Commission. Both are 33 years old. Kirby slips into Magpie after a meeting and joins Fitzgerald and Pryor. 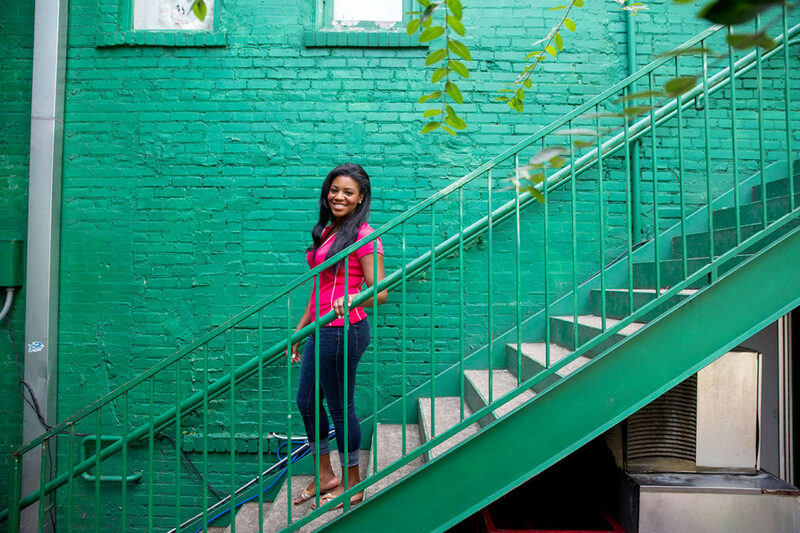 The 23-year-old South Carolina transplant moved here last August to work at IBM. It wasn’t long before he met the Commerce crew at the rooftop pool. Such is life in downtown Baton Rouge. Ask almost any resident, and they’ll say they love where they live—which explains the growing supply and demand for residential space. Apartment units in the Central Business District have multiplied six-fold since 2015, and occupancy rates hover above 90%, while new developments seem to go up overnight. There were other concerns: Could downtown actually be safe and livable? How do people find all they need among the high rises and city streets? Easy. They walk—to their workplaces, gyms, banks, hair and nail salons, and Prescriptions to Geaux pharmacy—all of which can be found downtown. Commerce has come back in a big way to the revitalized area. A game changer was the 2015 opening of Matherne’s Market, the first full-service supermarket downtown in 50 years. There are also nearby schools, churches, a farmers market, green spaces and bike paths. Fitzgerald doesn’t even own a car. No need. He can reach most of his destinations by foot and uses Uber or ZipCar when necessary. Kirby’s vehicle has only been filled with gas three times in the year since he moved downtown. It’s a perk of being able to live, work and play all in one place—a goal downtown has long strived to reach. 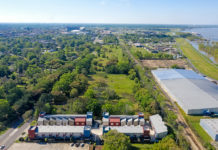 Today more than 9,000 residents live downtown, according to the DDD, an area that expands beyond the CBD to include Spanish Town, Beauregard Town and Downtown East. The population grew by 5% in 2016 alone, driven by a wave of new apartments, such as 525 Lafayette, 440 on Third and the Commerce Building. In the CBD, upscale apartments jumped from 53 units in 2014 to 348 in 2017—a nearly 600% increase over three years. The largest complex yet—the Lofts @ 6C—will add another 142 units when it opens next year. Since the boom began, people have flocked to the new apartments. Today, few units are available. When BRAC polled upscale complexes in late August, the average vacancy rate was only 6%, which speaks to the success of the area’s residential rebirth. But downtown is not without its challenges. Despite a number of high-end apartments, the CBD lacks affordable options. The average rent per square foot is $1.84, compared to Baton Rouge’s average $1.08-per-square-foot rent. At least one complex—438 Main Street—has both market rate and subsidized units. Helena Cunningham, CEO of National Housing Consultant Services, developed the 22-unit complex in 2013, which has fared well, but she says more is needed. There’s also a dearth of condos and townhomes downtown for residents who want to own rather than rent. Parking can be pricey and difficult for those without dedicated spots. Residents say they could use more green space and better connectivity to nearby communities. As for bigger-picture obstacles, downtown struggles to overcome negative perceptions in other parts of the parish. Suburban residents often argue too much money and resources are funneled into downtown, while their communities go without. 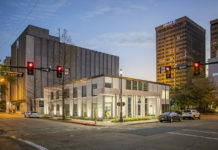 But the ongoing downtown-suburban feud is misguided, says Elizabeth “Boo” Thomas, a major player in the revitalization of downtown Baton Rouge, beginning with Plan Baton Rouge in 1998. Meanwhile, some still perceive the downtown area as it once was—surrounded by blight and crime, which does exist in some pockets but has largely been reduced thanks to redevelopment efforts. For that reason, despite the progress made, living downtown remains inconceivable to many in the Capital Region. Munson, his wife and their 9-year-old son have been living in a two-bedroom unit in the 525 Lafayette complex for three years. They previously lived in the suburbs but grew tired of long commutes to the city. Munson says they love being part of the downtown community and couldn’t imagine living anywhere else now. But he knows it’s unconventional. The Munsons are one of only a few families living in the CBD. There aren’t many housing options built to accommodate families, and the ones that do are expensive, he says. It’s difficult to find a modest apartment with space for more than two people and nearly impossible to find a place to own rather than rent. So who else occupies downtown? Well, a predictable 84% of residents are single and one-third are between the ages of 20 to 34 years old—the largest age group, according to DDD. These are typically mobile people. Most haven’t put down roots or started a family yet. They want to live among friends, close to entertainment. They want the downtown experience. And downtown wants them. “We need young millennial talent in Baton Rouge, and they don’t want to live at a house with two acres,” says Fitzgerald, of BRAC. He adds that a lot of downtown dwellers are not native Baton Rougeans, but transplants who moved here for work. After state offices returned downtown in the early 1990s, a number of businesses, agencies and other workplaces followed, such as IBM and the Water Campus, promising desirable employment opportunities. As a result, the downtown population looks a lot like Fitzgerald, Pryor and Kirby: young, talented professionals. Since moving into the Commerce Building, they’ve gone from complete strangers to their own close-knit community—one that is distinctly different from traditional Baton Rouge and, at the same time, everything Baton Rouge needs. The business community and city leaders routinely talk about how important attracting and retaining top young talent is to the local economy, and if anywhere in Baton Rouge has the potential to do that, it may be downtown. “As long as I’m in Baton Rouge, I’m staying downtown,” Pryor says. And while rental rates are more expensive in the CBD than the rest of Baton Rouge, out-of-state residents like Fitzgerald say it’s still cheaper than other cities. In his hometown Chicago, he says, rent would be twice as much. Plus, the apartments offer package deals, says Tina Rance of Commercial Properties Realty Trust, which manages three downtown complexes: 525 Lafayette, OneEleven and Onyx Residences. Units offer smart home technology, and cable and internet access, included all-in-one in rent payments. 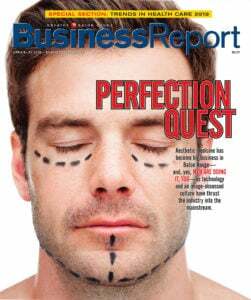 “It’s a very attractive package that caters to the young professional,” Rance says. The apartments appeal to empty-nesters, too, she adds. Older couples have sold their homes and moved into downtown units, often because they no longer want to take care of yards and home maintenance. There are also residents who rent apartments as second homes. The complexes CPRT manage all run above 90% occupancy. “Progressive people who are interested in alternative mobility and a place to the live, work and play where they don’t have to get in a car and in traffic—those people are really embracing it,” Rance says. —C.C. Henson, walking from her apartment above Happy’s Irish Pub, where she works as a manager. Aside from upscale units, the CBD does offer a few older, one-off apartments atop restaurants and bars. C.C. Henson lives in an apartment above Happy’s Irish Pub, where she works as a manager. She says one-bedroom units like hers run about $1,000 a month, which is slightly cheaper than newer complexes, while still located right in the middle of the CBD. In terms of what’s lacking, residents like Henson and Pryor say downtown could use more retail and clothing boutiques. Fitzgerald would like to see a mixed-use Perkins Rowe-type development, along with a concert venue or brewery. He says the upcoming Electric Depot on Government could fill that void. What downtown may need most, though, is better connectivity and transportation, says Michael Barton, an LSU sociology professor who moved from New York to Baton Rouge in 2013. His first experience downtown was on an LSU gameday when friends from Spanish Town invited him to watch the game downtown. To his surprise, barely anyone was there. When he asked his students why that is, he learned a lot of it has to do with transportation. The LSU student population is one big untapped resource that spends money on the weekends, but not downtown, Barton says. He suggests more investments and developments will attract and connect students and others outside downtown to the area, but it will take time to see results. That strategy is already taking shape. In addition to the city and state, private businesses and developers are putting their money on downtown Baton Rouge. The most convincing sign may be developer John O. Hearin’s Lofts @ 6C apartments, taking the place of two former surface parking lots on Sixth Street. For decades, Hearin’s family has owned downtown parking lots that generate easy money, trumping any other use for the sites—until now. Hearin has followed the transition of downtown since Plan Baton Rouge in 1998. And in recent years, theory and reality have crossed, he says. Downtown is ready for bigger and greater things.